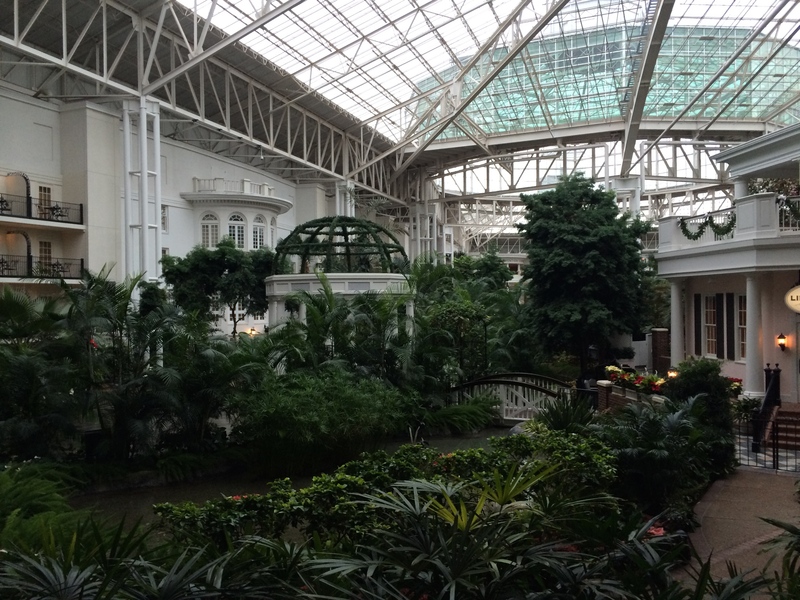 Staying calm at Nashville’s Gaylord Opryland Hotel | Oh, the Places We See . . .
Stay calm? 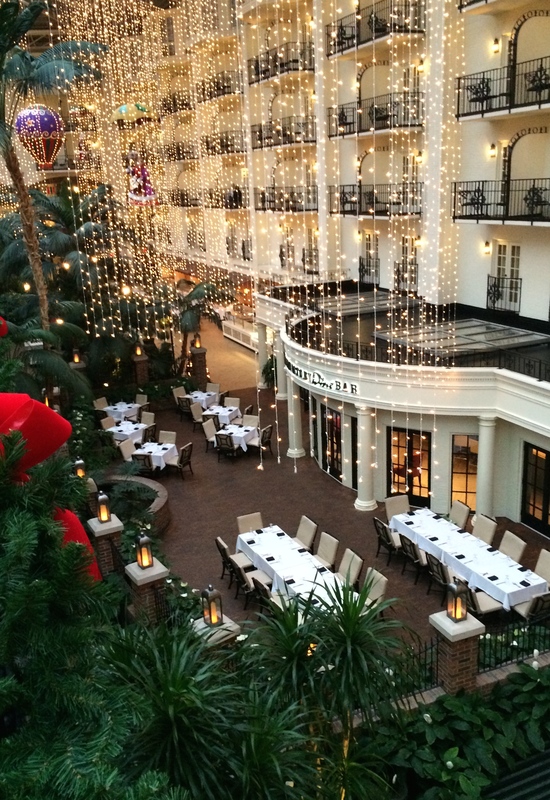 At the Gaylord Opryland Resort & Convention Center? Is that not an oxymoronic question in itself? With 2,711 guest rooms and 171 suites on six floors, you would think it an impossibity to indulge in rest and relaxation. Especially when an event such as the conference I attended last week — Learning Forward 2014 — brought together 3,600 educators in 600,000 square feet of meeting space. But yes, you can stay calm. And relaxed. And enthralled. You just have to know where to go in this magical, multi-space resort where gardens flow harmoniously into well-appointed living spaces. First, ask for a balcony room in the Delta wing of the hotel so you have a view of the Garden Conservatory, an architecturally beautiful space with a glass ceiling open to the sky. Swing open the door to your balcony and enjoy the lush greenery that awaits you — palm trees, ferns, manicured shrubs and, at this time of year, massive plantings of pink and white and red poinsettias. 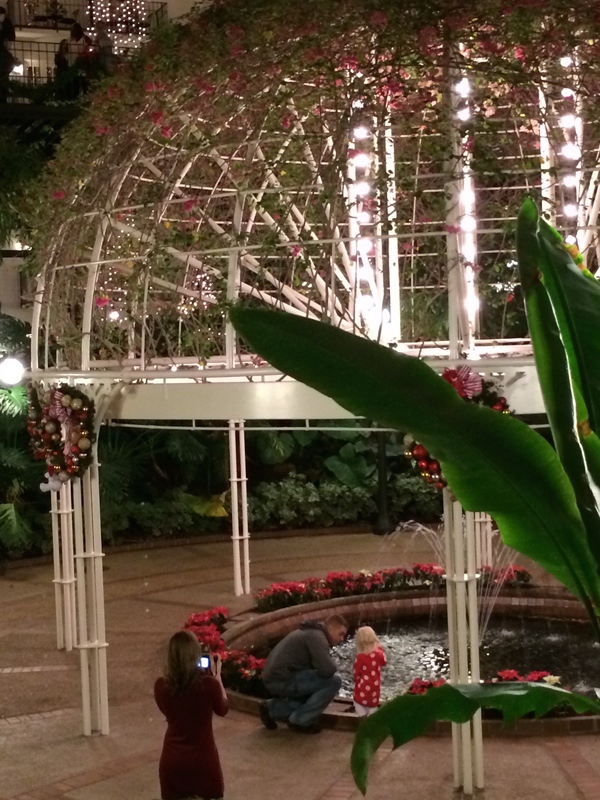 Watch as people take pictures of family members near the light-bedecked gazebo . . .
or climb into one of the boats meandering the waters and listen while a guide selects other features of this indoor paradise to share with you. 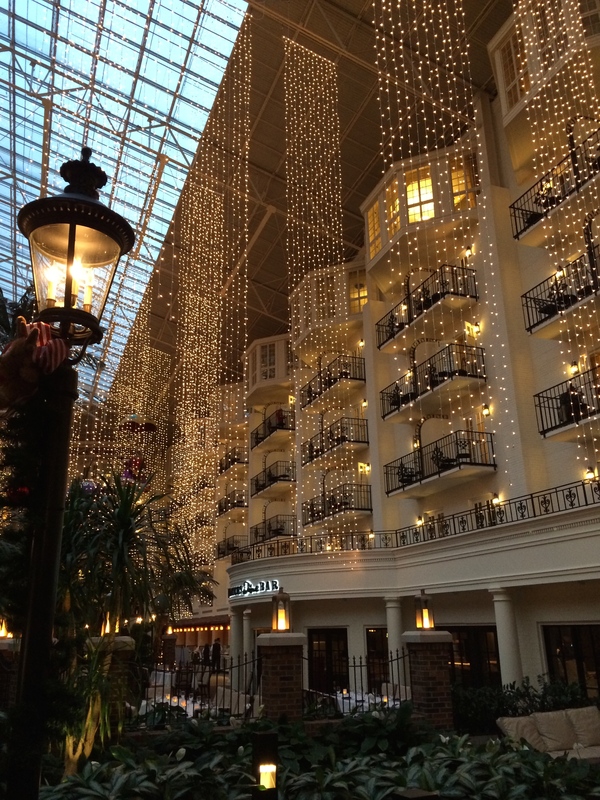 Indulge in the sights of balconies aglow from ceiling-hung strands of twinkly lights . 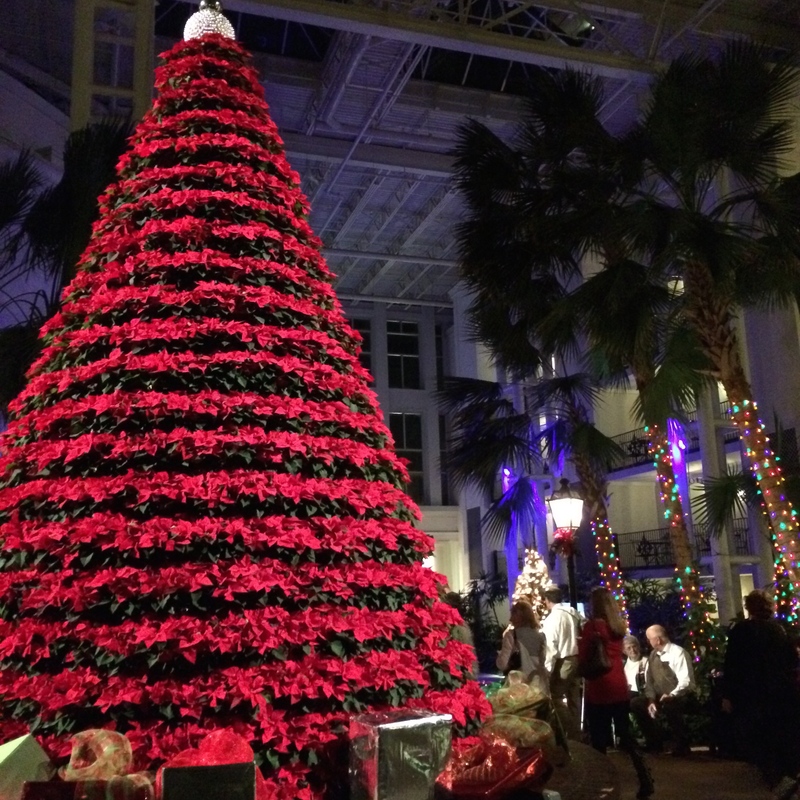 . .
or stand in front of the all-red poinsettia tree and take a selfie for your Christmas card! Second, just sit a spell on your own balcony and notice how others are enjoying the privacy even in this full-to-capacity resort. You might want to pamper yourself with a massage right on your balcony or just share early-morning coffee with your roommate. But if you choose to roam, you can still remain calm. Bring your walking shoes and “hike” the walkways above the gardens. Look down at the restaurants yet to open . . .
or the shopping areas where people gather but you hardly hear them. 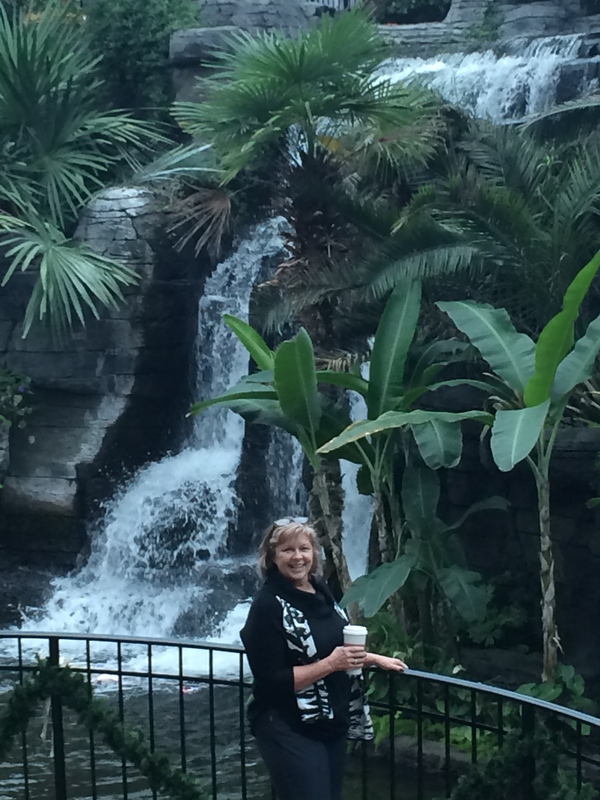 You may opt for sipping coffee in front of the waterfalls just as my roommate Terry Frost of Knoxville did and plan your day. Will it be shopping? picture-taking? attending a conference? or simply “staying put” in one of America’s premier resorts? 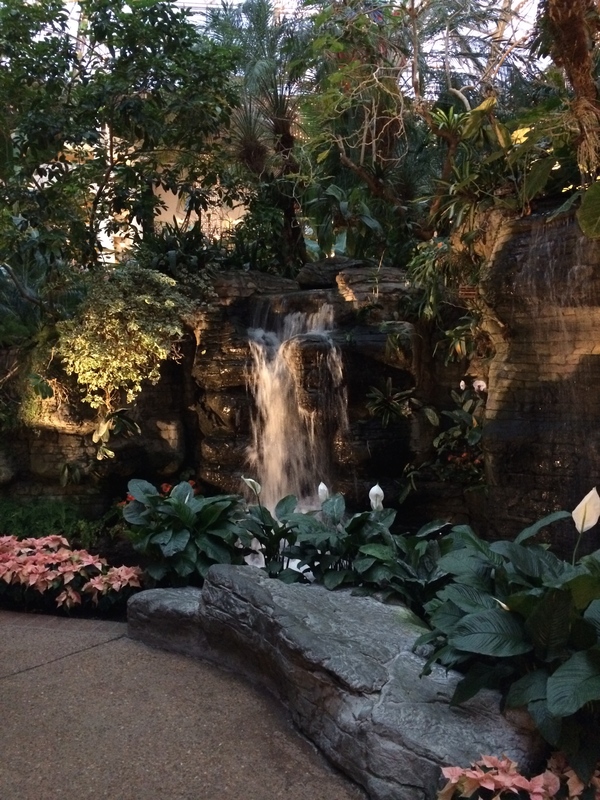 Whatever you choose to do at the Gaylord Opryland Resort & Convention Center, rest assured that you can be hurried and active or calm and relaxed. The choice is up to you! 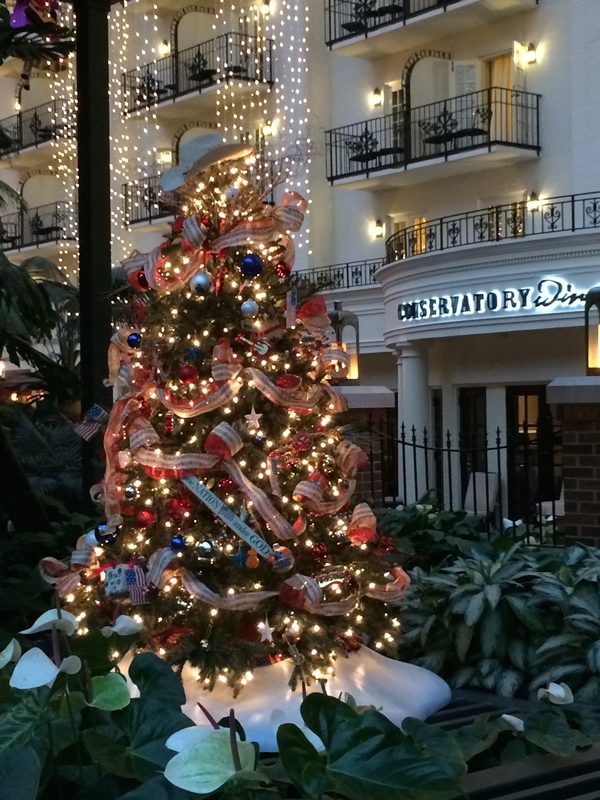 Colorfully decorated trees seem to be everywhere at Gaylord Opryland Resort! Book early. Space fills up quickly, especially if there is a convention at the hotel. Ask for a balcony room, if it fits within your budget. It’s worth it! Check out the restaurants and early-morning coffee places. 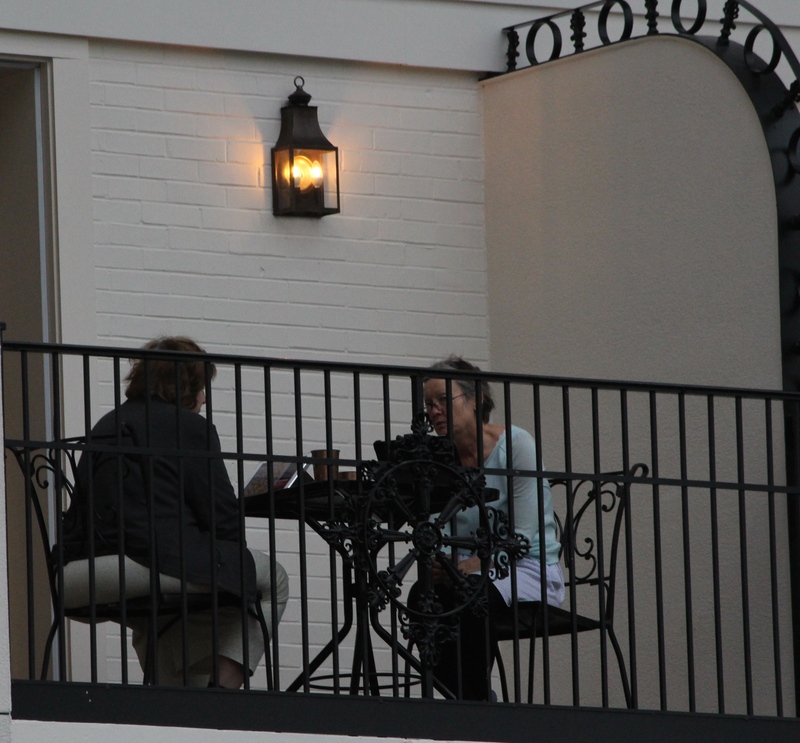 Lines get long as walkers roam the hotel early and then stop for a pastry and coffee. 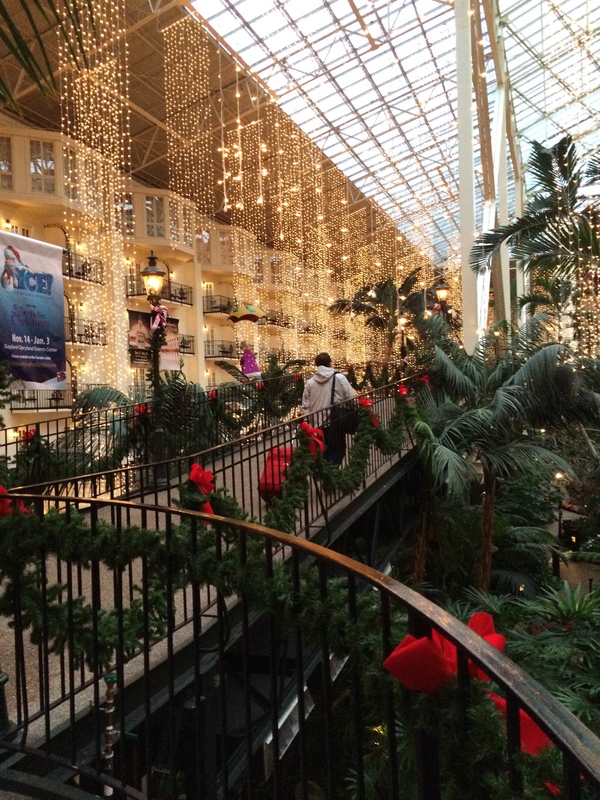 This entry was posted in Destination, Gardens, Hotels, Tennessee, Travel and tagged #learnfwd14, Garden Conservatory, Gaylord Opryland Resort, Learning Forward, Nashville, poinsettias, Tennessee. Bookmark the permalink. Whoa! That’s a one-of-a-kind hotel. We wish we could stay in places like these one of these days. With our limited budgets, we always stay in bed and breakfasts, pension houses (inns), or homestays. This is a one-of-a-kind hotel, and I wouldn’t have stayed there if it hadn’t been for business. We were lucky that we could combine business and pleasure at this special holiday time. Thanks for reading and commenting. And please remember that we are budget travelers all the way! Oh wow! That reminds me of a luxury cruise ship like the QEII or something. Very grand indeed. You know, Suz, you may have the best comparison of all. 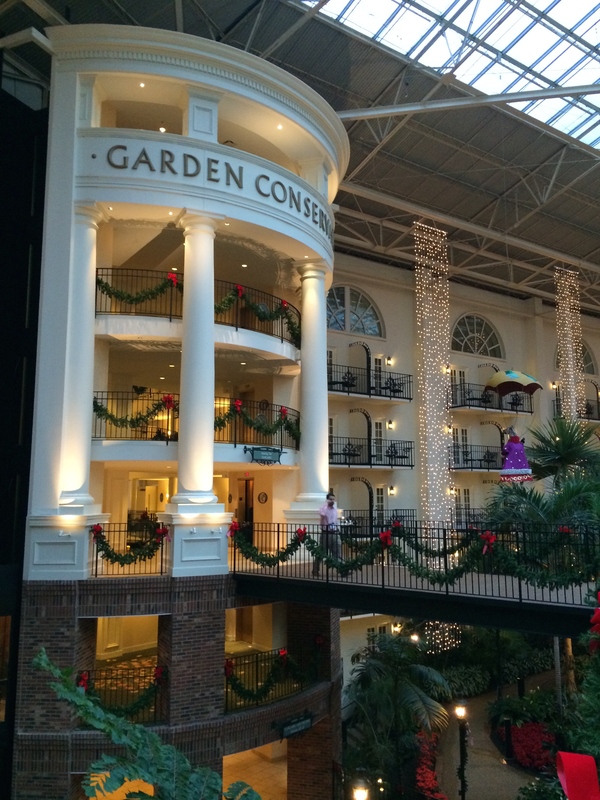 The Opryland Hotel is like a mammoth cruise ship — so much to do, so much luxury, and so many people! I knew I needed a cruise right before Christmas this year! Apart from when we went to Vegas, I don’t think I have ever, ever seen a hotel as huge as this! I can’t believe the gardens and the river running through it! I agree! I’ve been to Vegas, and this hotel rivals almost anything there. But — no casino! Didn’t miss that at all. 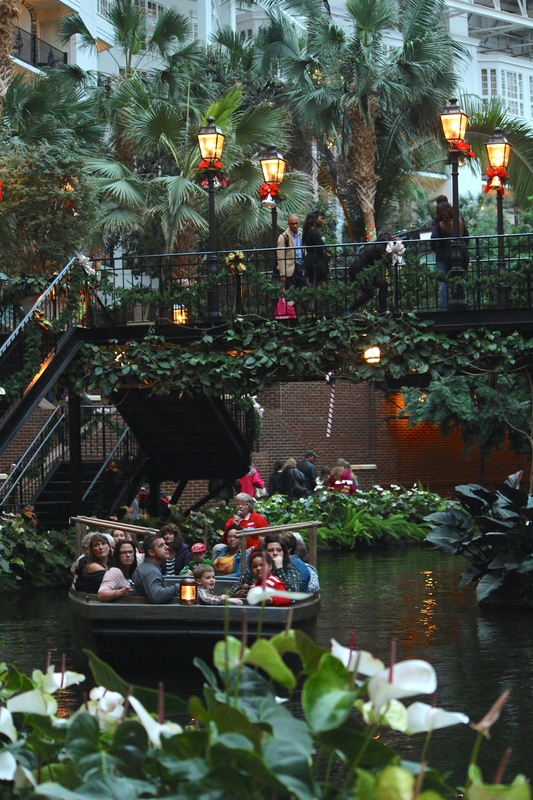 So much to do and see at the Opryland. Come visit Tennessee! Maybe one day… There is so much to see and do In the USA, I think it will take me a lifetime! 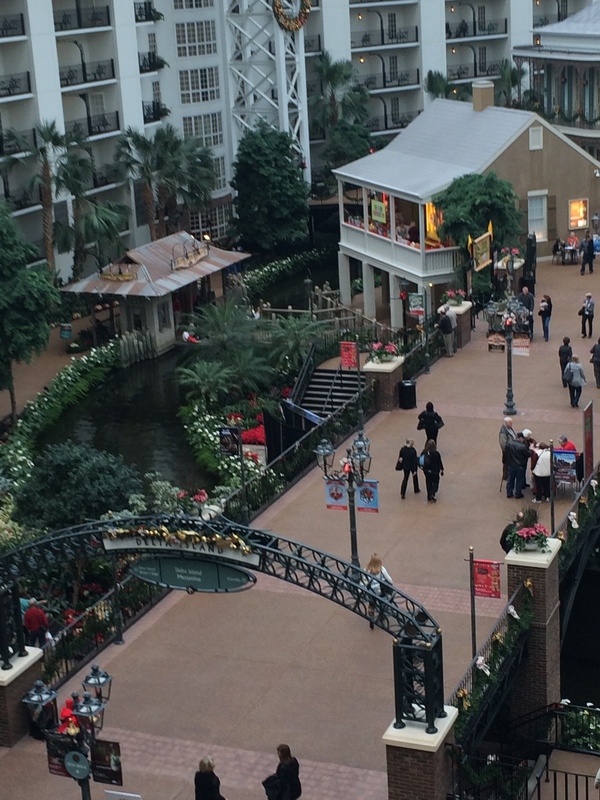 They even have a river boat going through the hotel…?! Amazing! Grand!! That river boat is amazing, and there was always a line of people ready to board! This is one enormous hotel — one of the largest I’ve been to. But well-run and beautiful! Thanks for taking a look. Happy holidays! What a grand and glamorous hotel! It is a grand ol’ place, for sure, Amy. I marvel at how they can have so many people stay there and do a great job of cleaning, serving, processing, etc. It’s a well-oiled machine! Thanks for your comment. You are so right, Linda. Those folks do know how to do hospitality! And that Southern red carpet thing, too! I love these lush hotels — could get used to living this way! Thanks for reading! Thanks so much, Curt. Although this is relatively close to home, I don’t get there often. But what a lovely place to stay! Guess I still would like to be rich and able to travel and stay in resorts. But until then, I’ll take a few days at a time any way I can get ’em!